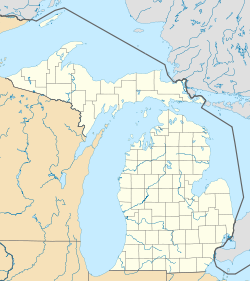 Waterford Charter Township is a charter township in north Oakland County in the U.S. state of Michigan. As of the 2000 census, the township had a total population of 73,150. Before being displaced by European settlers in the 18th and early 19th century, the area was populated with Iroquoian and Algonquian tribes of the Hurons, Ottawas, Ojibwas, Potawatomies, Miamis, Sauk, Sashabaws, and others. During the French and Iroquois Wars, the Iroquois expanded westward and maintained a temporary presence in the area, having displaced other tribes. However, by the time white settlers ventured into the area that would become Waterford Village, there were few Native Americans living in the area. In the latter part of 1818 Oliver Williams and his brother-in-law, Alpheus Williams, entered the first land purchase for $2.00 an acre ($494/km²). Archibald Phillips and Alpheus Williams purchased 161.40 acres (653,160 m2) in what became the Village of Waterford. In 1819, the Oliver Williams family established the first farm settlement in the county on the banks of Silver Lake. Archibald Phillips and Alpheus Williams continued on to where the Clinton River crossed the Saginaw Trail (now known as US-24/Dixie Highway). Here the first house of the Village of Waterford was built by Alpheus Williams on the north bank of the river. Archibald Phillips built his home across from the south corner where Andersonville Road meets Dixie Highway. Williams and Phillips also built the first dam where the Clinton River crossed over the Saginaw Trail and erected the first saw mill. The historic district of Waterford Township includes Dixie Highway, a block north and south of Andersonville Road, then Andersonville Road between Dixie Highway and Airport Road, south on Airport Road to the railroad tracks. Other neighborhoods in Waterford Township include Watkins Lake Estates, northwest of Scott Lake Road at Pontiac Lake Road; Elizabeth Lake Estates, south of Elizabeth Lake Road between Cooley Lake Road and Cass Lake Road; Drayton Plains, near where Dixie Highway and Sashabaw Road meet; Clintonville, near Lake Oakland; Four Towns, on the southwest corner of the township and home to Oakland Community College's Highland Lakes campus; and Huron Heights, on the northern shores of Sylvan Lake and home to the Summit Place shopping center. There are 35 recognized lakes within Waterford Township, and many parks, including the Pontiac Lake State Recreation Area, Dodge Brothers State Park and Waterford Oaks county park. Waterford Township is also home to the Oakland County International Airport. The Waterford School District supports two high schools. Waterford Kettering High School is located in the northern part of Waterford Township and Waterford Mott High School is located to the east. The township's original high school, "Waterford Township High School," closed its doors to regular graduating classes following the commencement ceremony for the Class of 1983. The building remained open for alternative classes, adult education and child care for a number of years, before being razed to make way for a new shopping center and residential development. Revenue from the Waterford Township High School property was used to build the Performing Arts Centers and Pool & Fitness Centers at both Waterford Kettering and Waterford Mott. Waterford is the home of the venerable world renowned stamp auction firm operated by Charles G. Firby. According to the United States Census Bureau, the township has a total area of 35.3 square miles (91.4 km²), of that 31.3 square miles (81.2 km²) of it is land and 4.0 square miles (10.3 km²) of it (11.22%) is water. Like the rest of Southeast Michigan, Waterford Township has a continental climate. 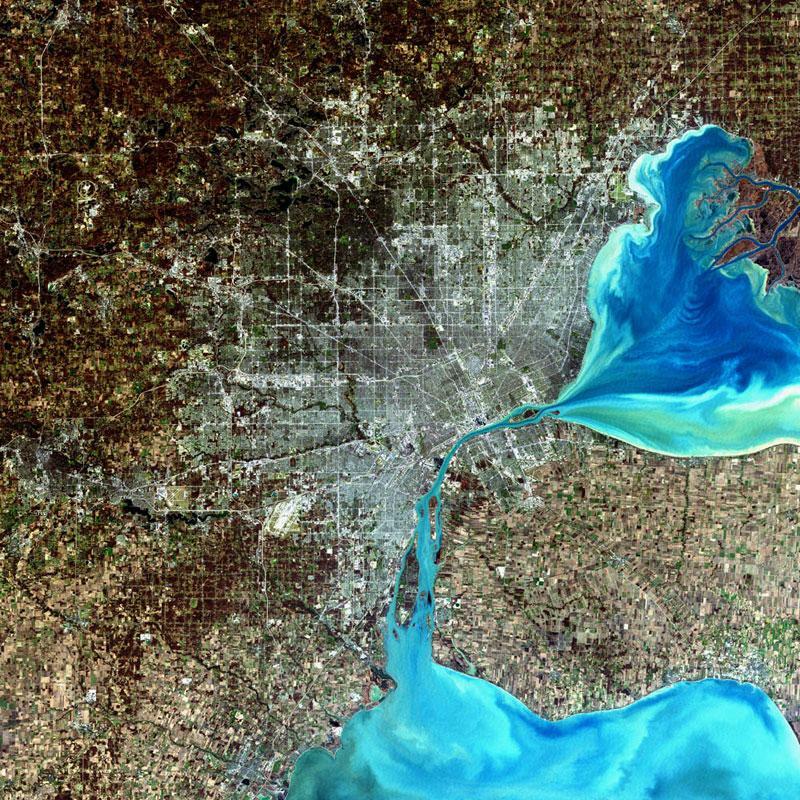 However, it has a somewhat higher elevation than Detroit (982 feet compared to 585 feet), and therefore the township is cooler than Detroit and other nearby cities. It is moderately cold in the winter with varied snowfall throughout. Spring varies from warm by day to cool at night. The township's warmest weather occurs in the summer with temperatures in the eighty to ninety degree range and typically high humidity. Summer is also the wettest season in the area. In recent years, Waterford Township has seen a few 100-plus degree days. Fall starts warm, but November ends with high temperatures barely above freezing. The U.S. Census Bureau has also defined Waterford Township as a census-designated place (CDP) in the 2000 Census so that the community would appear on the list of places (like cities and villages) as well on the list of county subdivisions (like other townships). The final statistics for the township and the CDP are identical. There were 29,387 households out of which 30.4% had children under the age of 18 living with them, 51.6% were married couples living together, 9.6% had a female householder with no husband present, and 34.9% were non-families. 27.9% of all households were made up of individuals and 8.1% had someone living alone who was 65 years of age or older. The average household size was 2.42 and the average family size was 2.99. In the township the population was spread out with 23.2% under the age of 18, 8.2% from 18 to 24, 36.0% from 25 to 44, 21.8% from 45 to 64, and 10.8% who were 65 years of age or older. The median age was 36 years. For every 100 females there were 99.6 males. For every 100 females age 18 and over, there were 97.5 males. The median income for a household in the township was $55,008, and the median income for a family was $64,500. Males had a median income of $47,409 versus $32,016 for females. The per capita income for the township was $27,432. About 3.8% of families and 5.1% of the population were below the poverty line, including 5.8% of those under age 18 and 4.0% of those age 65 and over. Oakland County International Airport is located in Waterford Township, Bishop International Airport - Flint, Michigan, and Detroit Metro Airport - Romulus, Michigan. ^ "Waterford township, Oakland county, Michigan." U.S. Census Bureau. Retrieved on October 28, 2009. This page uses content from the English language Wikipedia. The original content was at Waterford Township, Michigan. The list of authors can be seen in the page history. As with this Familypedia wiki, the content of Wikipedia is available under the Creative Commons License.